>The Chinese are coming to plant rubber trees, whose lands will be illegally grabbed next? HAIKOU, March 31 (Xinhua) — A Chinese company signed a contract here Friday with a Cambodian counterpart to plant rubber in the southeast Asian nation, the first such move to increase China’s self-supply capacity of the valuable industrial material. 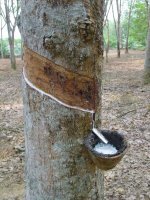 According to the agreement signed between Hainan Natural Rubber Industry Group Corp. and Suigang Investment Development Co. Ltd. of Cambodia, the Chinese firm will be able to grow natural rubber, establish rubber and wood processing plants on a land of 62,659 hectares in Cambodia, and operate rubber trade. “We will adopt the latest industrial standards in the project, taking advantage of Cambodia’s abundant natural resources,” said Wu Yarong, chairman of the board with the Hainan-based company, China’s largest rubber producer. With over 250,000 hectares of cropland, the company produces 250,000 tons of natural rubber every year, which accounts for about a half of China’s total output. “The cooperation project will help improve the living standards of Cambodian people,” said Sim Sonthim, chairman of the board with Suigang. China has become the world’s largest rubber consumer and importer since 2001. The national consumption hit 2.04 million tons last year, however, the annual output capacity was some 500,000 tons. Facing the mere 600,000 hectares of arable land of rubber mainly located in Hainan, Yunnan and part of Guangdong provinces in southern China with abundant rainfall, Chinese rubber producers are focusing their eyesight on African and southeast Asian regions where huge favorable land resources are still left unused. Rubber expert Jiang Jusheng said the cooperation with the Cambodian company marks the turning point of Chinese enterprises’ pursuit of a new development mode for rubber industry to practice. The Hainan-based rubber company also plans to invest 1.3 billion yuan (162.5 million U.S. dollars) in the establishment of a rubber processing factory with an annual output capacity of 300,000 tons and a rubber trade firm in southeast Asia by 2010, and acquire the right of using 140,000 hectares of land in African and Southeast Asian nations, said Wu. 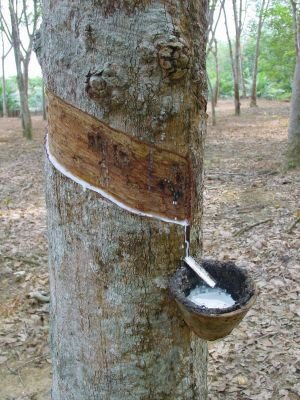 Another Chinese rubber giant Yunnan Natural Rubber Group Ltd. also aims at planting over 3,000 hectares of rubber in a demonstration project in Myanmar by 2010, preparing for the expansion of 30,000 hectares. Chinese rubber producers are stung by soaring price, which has rocketed to a maximum of 22,000 yuan (2,750 U.S. dollars) per ton in the world rubber market from nearly 6,000 yuan (750 U.S. dollars) five years ago, according to Jiang. China’s automobile industry will require some 716,000 tons of rubber in 2010 and 1.63 million tons ten years later, according to Chinese Academy of Automobile Engineering. Prompted by the strong desire to seek overseas development, Chinese rubber firms are suffering from some business problems like transportation inconvenience and dual taxation both at home and abroad.